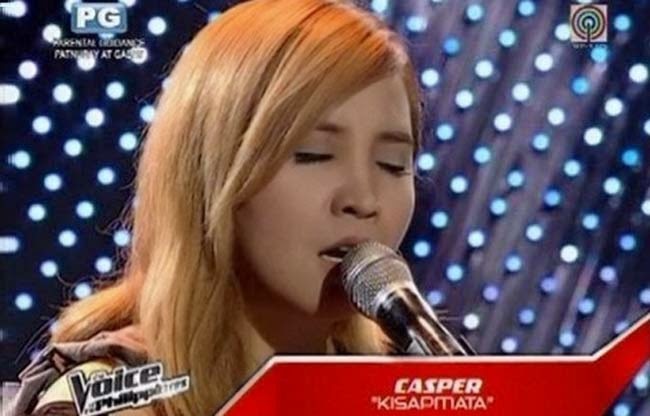 Casper Blancaflor, 25 years old from Quezon City was one of the artists who inherited music from her parents. Casper is a song writer with parents who are both musicians. Her dad is a musical director and her mom is in Thailand, she still sings. Her parents are separated already a long time ago and her dad has his own family now. Casper is staying with her grandmother who served as her mom. What’s interesting about Casper is that during the Blind Audition, he was with her. He explained that no matter what happens he is still her dad. Casper’s performance was dedicated to her parents for the influenced that they left in her life which is the gift of music. She is forever thankful for that. Casper started plucking the guitar strings with her performance of the song “Kisapmata” in her own version that instantly made Coach Bamboo decide to turn his chair. The next coach who pushed the red button was Coach Lea on the part when Casper gave an effect on the song. While Casper was performing on stage, her father was so emotional on backstage. Coach Bamboo could not help but sing with Casper with the song which was a Rivermaya hit. Coach Sarah said that Casper’s voice was distinct that made Coach Bamboo and Lea turn his chair. Coach Bamboo said that he will never turn on a certain song unless the artist will bring on something special. Coach Lea said that it was rare for her to hear a voice like Casper’s with a heart. Casper chose Coach Bamboo.